From the main menu select Invoices -> Add. At the first step of creating a document you are required to select a client. All of the customer’s information, such as name / company, address, activity etc, is copied onto the document from their contact. That way, altering a customer’s contact details will not affect how they appear on the documents you have already issued to them. IMPORTANT: Client selection is mandatory before you can select products / services. The relevant fields remain deactivated until you select a contact. 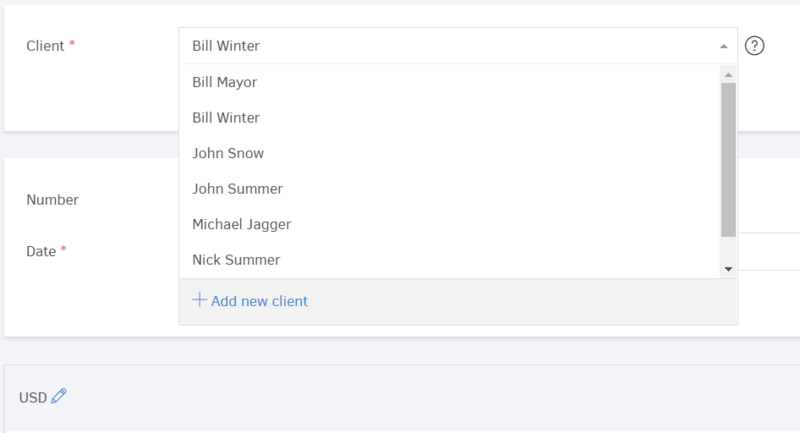 While typing some of the client's name letters in the "Clients" field, a drop-down list appears with related options. Once you choose the preferred one, Elorus will automatically fill in the required fields with the information provided by the customer’s contact. By selecting “Add new” you can create a new contact. In reality, by selecting this you are transferred to the “Add new contact” page and the information you submit there will be available for future use, as a new contact will be created. Once a contact is selected, you may edit certain fields that you wish to appear in this particular document. It is worth mentioning that any changes will not affect the original contact. This is possible only on the contact’s details page. The next step is choosing the desired document type from the respective field, by clicking on the arrow next to it appears a list of options. In case you wish to issue a sales document but cannot find a document type to match your case, you can easily create it by following the instructions found in the related article. Next, you need to set the document's date either manually or choose one by clicking inside the date field. In case you have created series in Elorus you can choose one from the "Number" field and the application will automatically resume its numbering for the document at hand. > Apart from the series, Elorus numbering system is automatic by default for all document types. However, you can also number your documents manually too or start from a certain number if you like. For more information on document numbering, refer to the related article. If you do so, Elorus will promptly notify you when that date elapses and the document will be marked us overdue automatically. From the “Amounts are ..” field, you can determine how Elorus will calculate taxes for your products/services: If you select Tax exclusive, the amounts you enter per contact will be considered tax exclusive. Tax inclusive is the case where the price includes tax. For more information, visit the related article. In the following step, you are required to choose the products/services included in your document. 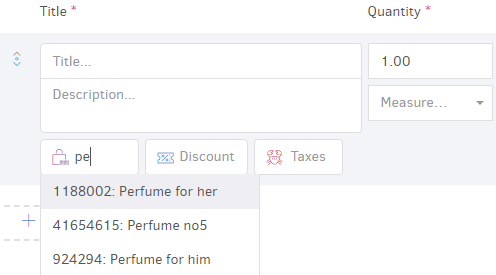 Below the Products / Services section, you can enter already existing items or submit news ones manually. While typing the first letters of an item’s title or some numbers contained in the item's code, a drop-down list will appear from which you can select the desired one. Once you select an item from the list, Elorus will automatically fill in the rest of the item details (price, measurement, taxes etc). Selecting an item from this list you make sure that its stock will be monitored (if enabled for this item, see related article). 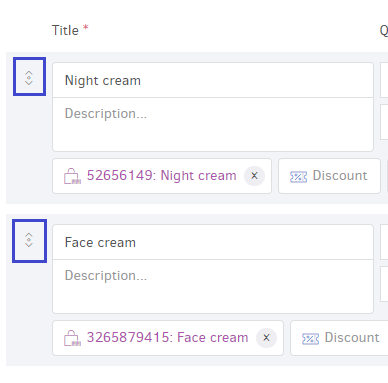 If you leave this field blank, the system will not be able to correlate the invoice (the sale) with the item's inventory and therefore will not manage it (reduce the total number of available items). If your products have a tax rate but your contact has a different default tax, the second will replace the VAT of the item. For more instructions on how to create products/services in Elorus, refer to the related article. Note: If you haven't already set tax rates for your products/services, you have to select one for every line of product/service table, so the calculations are correct on the document's total amount. Here you can set how the product/service will appear on the document. You may also add a detailed description of the item by typing it below. Then you must apply taxes from the related field. In case you wish to re-order the items included inside a document you may “drag and drop” them by keeping your cursor pressed on the indication in the red box, as shown in the image below. Νote: In case you want to issue documents in foreign currencies please visit our article. If you have created tracking categories for your sales documents, you may choose the desired one(s) to track each invoice you create. Below the table of terms and conditions tables, you'll see the tracking categories field. First, you'll have to select the category and next the option. By clicking Add New, you can create a new tracking option on the spot instead of visiting to the tracking categories menu, as a shortcut. You can also assign a tracking category from each document's view page, after having saved it. For more information about tracking categories, visit the related article. After you finish editing the document, you can choose to save it as Draft or as Issued. While in a draft state (#N/A), you are able to edit all of the document’s fields, alter its products/services sections etc. At the same time, you cannot add payments to it while it does not participate in the financial reports of Elorus. If you are ready to issue the document, you can choose to save as issued. Or, deactivate the draft state from the document's preview page. In this case, it is considered that the document has been issued. Once you add a payment, the status of the document changes to partially paid or paid, depending on the amount you received (for more information on receipts and payments, see related article). In case you have set a payment date that elapsed, then the document’s status will change into “Overdue”. Before you can edit a document, it will have to be in a draft state. If the document has already been issued and you wish to edit it, you will have to turn it into a draft again. By clicking on “Edit”, Elorus will ask you to confirm the status change. In case there are payments associated with the document, they will have to be deleted for it to become a draft again.